Looking to liven up your balcony or outdoor space? Get to Hyderguda Nursery and buy the right plants and gardening accessories for your home. An old-fashioned rustic doorway leads you to a careful arrangement of plants inside the Hyderguda Nursery. Grafted cacti and lucky bamboos are by the counter at the entrance and a vast array of greens lies ahead. You’ll find indoor and outdoor plants, exotic flowering shrubs, fruit trees, ferns and almost any other plant you can think of, for your garden, balcony or terrace. On one side are succulents and bonsai plants too, and there are over 60 different kinds to choose from. The staff is quite friendly and will walk you through the nursery educating you about the plants and their care routine. We loved the white orchid, Kashmiri rose plant, and also picked up some succulents for our study table. Apart from the diverse planing options, you can also get garden decor and accessories here. They have polka dot pots, ceramic pots in solid colours, hanging pots, as well as gardening tools like watering cans, shovels. If you want to grow your own plants, they do sell seeds for certain fruits and flowers. The prices are quite affordable starting at INR 120 for succulents and pretty much every plant can be bought under INR 200. So, build your dream garden and make yours the greener side of the street. 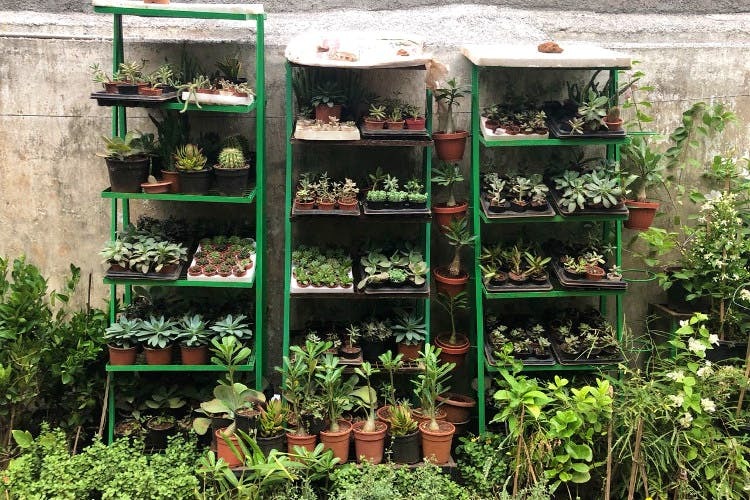 Especially if you live in and around Basheer Bagh, this is your one-stop shop for all things gardening and to grow your own little kitchen garden. Let’s get our hands muddy now! Although their present collection of tools and accessories is really cute, we'd love more variety.